We were, once again, driving with The Association on the juke, and I was, once again, amusing myself. “Who’s reaching out to capture a moment?” I asked in song. “Everyone knows it’s West-bye!” I’m hilarious like that. We shared a chortle and continued, and, once again, my brain continued on this non-linear side street. 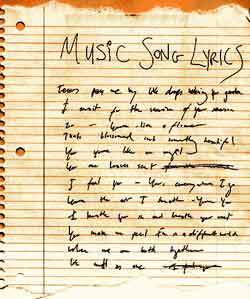 Lyrics are funny things, especially when they are the lyrics that exist only in your head. Example: when I was seven or eight, I got the 45 of The Eagles’ “The Long Run,” and I heard the lyric, “Did you do it for love, did you do it for money, did you do it for Spike, did you think you had to, honey?” And for years after, I always wondered about Spike, and what our unnamed female protagonist did for him. Who was this Spike, and why didn’t he get more mention in the song? Many years later – more recently than I’d care to admit – I had a mini revelation. I may have been listening to Lou Reed’s infamous lyric, “When I put a spike into my vein, and it makes me feel like I’m a man,” or that line might have just been in my head. But it hit me all at once: could the Eagles lyric be, “Did you do it for love, did you do it for money, did you do it for Spike…” as in heroin?!? Yes, that makes sense! It was the 70s, after all. I brought this up with a friend, well proud of my thirty-years-too-late brainstorm. I had built an entire narrative in my head, based on a misunderstood lyric, and kept it for thirty years. In one nanosecond, I had a brainstorm that comPLETEly altered and replaced my faulty narrative with a new, nefarious one. And then in one nanosecond, THAT faulty narrative balloon was popped and replaced with the actual, much more benign narrative. I still kind of miss my man Spike. I guess that’s what I get for reaching out to capture a moment. I too am a king of the misheard lyric. We’ve all been there, Brian. At least you could make yours make sense. Even then I was probably trying to liven up the work of Don Henley: World’s Most Boring Drummer (and figurehead of the Dead Drum Era). Me too! BRING BACK SPIKE, THE MAN, THE MYTH!! There are so many songs I’ve misheard. I only sing really loudly when no one is around…just in case I don’t actually know what I’m singing. In my youth I butchered “Ferry Cross the Mersey” by Gerry and the Pacemakers and turned it into “So very Customary.” haha! The entire context of the song was lost on me. (Why would I have any reference for the Mersey?) When my sisters heard me singing these lyrics they almost collapsed from hysteria. Also, the Lou Reed line I referenced is in “Heroin” on The Velvet Underground with Nico, and I suggest – nay, demand – you write your own version of this topic. I don’t own it, and I want to crack up at your take. GO! Oh, right, what am I thinking? That’s also on Rock n’ Roll animal, right? I’ll think about it. Thanks for the kind encouragement, Brian. Don’t compare your work to me. Write your best work for you. I’ll bet it’s great stuff. Jane Weaver! BWAH! Sigourney’s sister? You nut! You’re capturing my moment. And wings to fly! Thank you Brian. This is pretty funny, Brian. Like someone else said, we’ve all been there. Yours, at least, made some sense. I can sing along to so many songs, but realize I don’t actually know the words. Half of the time, I’m basically interpreting the lyrics phonetically, complete nonsense. Yeah, I love that I had an actual working second narrative, rather than just hearing, “there’s a bathroom on the right” rather than “there’s a bad moon on the rise.” Go seven-year-old me! It makes sense. After all, they were drinking all of that Clearwater. Brian, this is truly funny – kind of like reading a word for years and thinking it sounded one way and making the connection years later. As for lyrics, I once heard an Italian cover band sing “Sailing” by Christopher Cross phonetically – what an experience. They were good musicians but the words had a surrealistic quality. Actually, they were singing the English but phonetically – just imagine . . .
niiiiiiiice. I once spent a flight to Cancun listening to The Beatles In German channel. Nothing better than Sie Liebt Dich Ja Ja Ja! on infinite repeat at 34,000′. I will say, though, that the ‘ceilings did an outrageously great cover of Pink Floyd’s “Fearless”, and I wish a tape existed to prove it. I say after 30 years, Spike has probably earnt his place. When my sister was a kid and I tried to correct her lyrics – in the charming way that only a big sister can she’d snap back at me “No! I’m singing a DIFFERENT song!”. It’s one of the sad realities of maturity that we concede defeat on these issues. I’m sure. Have definitely made up quite a few lyrics in my time. But I’m probably a much bigger offender in having read words and never questioned their meaning or pronunciation, they made sense to me in context. Earth shattering moments in young adulthood when I found out the truth. Albeit (pronounced All Be It and not “albay”) is the best example I can think of right now, but there were so so many. BWAH! Yes, pronunciation! That’s a whole ‘nother minefield (or mind-field), innit? Good stuff. Great to have you here, thanks! Glad to join. My other pearler, I just remembered, I always thought people ‘wade in’ on a debate/argument, rather than ‘weighed in’. I think my version is better. I’m much more cautious about wading anywhere. Particularly in murky waters.